Þe Technocrats are fairly far along in turning Modern Man into, as Andrew Lytle calls him, Momentary Man - one who lives only for present pleasures with no thought for what came before or what will come hereafter. This is precisely the model of man we must turn from in order to live a life that is more than a gratification of the flesh, which is death. The best thing in this life, the most beautiful, is man filled with the Holy Ghost, man who is so pure that he reveals the wonderful Light of the Spirit that fills him and is joined with him. Matter and ghost together, not sundered as latter day false teachers tell us it must be, whether with Church and state, work and faith, God and His creation, etc. We must recover the truths of the past like these if we would live rightly and well, if we would experience a foretaste of the Kingdom of God here on earth while we work out our salvation. We must recover the truths of the past if the South is to become truly herself, to attain to the goal the Lord has set before us: the likeness of the forepattern of the heavenly Souð that the Lord God made when he called us into being as a people. Father Andrew Phillips speaks of this work and what it entails below. In a future post, we will look in more detail at how this work could manifest itself in the South. The eleventh century made the distinction between the secular and the ecclesiastical fundamental to European society and culture for the first time and permanently. Since this distinction was the foundation on which European civilization has been constructed, it is not easy for Europe’s children to remember that it might have been otherwise. Our history has been written by the victors in the struggle to bring this social order into being, in the certainty that their victory was right, and because it was right, inevitable. By the middle of the twelfth century the victors dominated the record almost entirely and their spiritual descendants occupied the commanding heights of European historiography until the Enlightenment, and of much of European education, including higher education, until well into the twentieth century. I am one of ‘Europe’s children’, one of those who in the second half of the twentieth century ‘remembered’, first by instinct and then by knowledge, ‘that it might have been otherwise’ in Europe. In other words, I made a spiritual pilgrimage to the roots of Europe and found Another Europe. This was made possible firstly by the fact that I had been born into a family linked with farming in the English countryside, so into the most traditional of backgrounds. This took me back beyond the little that those in the big towns were allowed to know, especially those uprooted in unEnglish London, back to the great realm of lost knowledge. Secondly, with shock my father, a soldier of the Second World War, also told me in childhood what he had seen of the unjust way that the imperialist Norman British Establishment behaved in Egypt and in other colonies, a way completely at odds with the far older, neighbour-loving, Christian traditions of popular England. All this gave me a sense of the beyond, a sense of piercing the veil beyond the present and superficial, getting through to the essence and roots of things, and also to a sense of my own destiny. The sense of the beyond came to me in my discovery of the Old Saints of England, who had lived locally. Their names in some form or other had been passed down in local place names, which is how I first came to hear of them, and yet their lives and feats had been made into foolish legends or else wholly forgotten: Felix, Cedd, Botolph, Audrey, Osyth, Albright, Edmund, Alfred and many others who witnessed to holiness, that which was quite unknown to the England of the present, meaning that all manner of charlatan could claim to be holy without being so. I noticed that these Old Saints had all lived long before the Middle Ages, itself a period long before the rapidly disappearing Protestant present of fifty years ago. And then I discovered at the age of twelve that that past was still alive in spirit in Orthodox Christian Russia and indeed in all the other much smaller and captive Local Orthodox Churches. At that time, however, the Russian Orthodox Church was Herself captive to an atheist regime, the ultimate, fully anti-Christian result of the spiritual degeneration of the Western world which had first begun to lose its way precisely by forgetting its saints, its Felixes, Cedds, Botolphs, Audreys, Osyths, Albrights, Edmunds, Alfreds and many others. Therefore it has somehow been my calling, obviously in a very, very modest way, to help contribute to a double restoration. Firstly, there has been the restoration, contributed to by so many, of the veneration of those Old Saints, not only of Old England but of all Old Europe. And secondly, especially in the last twenty-five years since the slow but long hoped-for resurrection of Russia began, and again in a very, very modest way, to help contribute from outside Russia to the restoration, contributed to by so many others who have played far, far more important roles, of the Centre of the Orthodox Church in Russia. This has meant struggling for the purity of Holy Orthodoxy against all deviations to left and right, both inside the Russian Church and in the other Local Churches. And this has also meant defending the Incarnation of Orthodoxy into life, both inside Russia and also in other lands, through the preparation and hope for the restoration of the Christian Emperor, the Tsar. For, since our Faith is not some private, individualistic, Protestant-style fantasy, this incarnational public restoration is the only thing that stands between us and the apocalyptic End of the World. I have lived and fought for the Church of God, quite naturally centred outside the secularist Anti-Europe which in its anti-Christian delusions so fears, hates and tries to destroy the Centre of the Church. I have done this so that ‘it might be otherwise’. I have challenged the victors and their spiritual descendants, the historiographers, who have supported that false and secularist millennial social order. In the certainty that their victory was not only wrong, but also not at all inevitable, I therefore venerate the Saints of Old Europe and honour all the others for whom it was otherwise. I have struggled to reverse the temporary, though millennial, victory of their Anti-Europe and unfolded the vision that it once was and again shall be ‘otherwise’. For in the third millennium the revolutionary New Europe, that is, the second millennium Anti-Europe presaged by Charlemagne in Aachen, may yet be overthrown. Thus, first millennium Old Europe can be spiritually restored through the Church of God in Europe, made possible as a Metropolitan extension of the Christian Empire of a restored Holy Rus. Holy days of the American religious calendar like Memorial Day serve to highlight how out of place the South remains in the American Empire, and will remain so long as she remains true to her calling as a Christian people (which calling she is in great danger of walking away from).
. . . Still, it has been difficult to use the words of Jefferson and Lincoln to support special interests and undermine personal freedom. The defenders of slavery before the Civil War came to reject the thinking of the Declaration of Independence. Some of the most consistent of them turned against not only Jeffersonian democracy but Reformation religion; they dreamed of a South dominated by medieval chivalry and divine-right monarchy.
. . . The first time of trial had to do with the question of independence, whether we should or could run our own affairs in our own way [Why, then, was the South not allowed to peacefully secede so that she could ‘run her own affairs in her own way’?--W.G.]. The second time of trial was over the issue of slavery, which in turn was only the most salient aspect of the more general problem of the full institutionalization of democracy within our country. This second problem we are still far from solving though we have some notable successes to our credit. So then, for trying to make the best of a bad situation (i. e., slavery, to which the Northmen contributed) and daring to hold to an understanding of God, man, and the creation that was different than the American understanding (which is to say, the Puritan-Yankee-New England view), Father Abraham and his Holy Army are to be justified and praised for sweeping down upon the South breathing murther and wrecking every bit of our theod (nation) - churches, houses, farms, fields, animals. And after the bodily attacks had ended, those on Southern beliefs continued (even to this day), whether by promoting secular scientism, writing a false history of the [u]nited States, destroying the symbols of the South, or besmirching our heroes. Any Southerner who thinks he needs to be a ‘good American’ first and foremost had better take some time to think about what that entails for him, his family, and his conquered and subjugated people.
. . . he [Soloviev] described how “nationality—either of the people or the nation—represents a positive force and every people has been appointed a special role to serve according to its special character.” Every nation, he claimed, possessed an essential character that had been impressed upon it by God. The character given to a Christian nation demanded that it fulfill its calling to preserve and disseminate the kingdom of heaven on earth. In fact, it was justified exclusively by its fulfillment of this calling. On the other hand, when a Christian nation ceased to fulfill its mission, or worked in opposition to it, it lost the justification to act on a world-historical plane. This was true especially when it pursued the ideals of ethnic nationalism, which distorted the otherwise productive force of national self-consciousness. In such a case, Soloviev claimed, “the positive force of nationality mutates into the negative force of nationalism.” The result was an “extreme antagonism” toward other nations, wherein “nationalism destroys its own people and makes it an enemy of humanity.” On the other hand, “Christianity, by abolishing nationalism, saves peoples because to be supranational is not the same as nationless.” According to Soloviev, then, nationality was a legitimate, God-given form of human community. Its divine purpose was to focus the community’s attention on the Christian mission to unify humanity and establish the kingdom of heaven on earth. For those who get swept up in the emotionalism of Memorial Day and other American ‘holy days’, there are important things that need to be brought out from this passage and elsewhere. First is the truth that ‘America’ is not a nation in the proper sense of the word but rather an assemblage of peoples (Indian tribes, the Southern States, Hawai’i, and various other islands from the Caribbean to the Pacific Ocean) in thrall to Washington City, held together by little more than force. Second, in keeping with Soloviev’s words, the current union of Captive American States shows that it is not primarily a Christian folk. It does not worship the Most Holy Trinity but instead its own greatness. This has led it to, as Soloviev says, show ‘extreme antagonism’ towards other countries, ‘destroy its own people’ (physically through abortion and endless war and spiritually through mindless ‘fun’ and materialism (the ‘American Dream’)), and ‘make it an enemy of humanity’. Memorial Day, which grew out of the Civil War, gave ritual expression to the themes we have been discussing. As Lloyd Warner has so brilliantly analyzed it, the Memorial Day observance, especially in the towns and smaller cities of America, is a major event for the whole community involving a rededication to the martyred dead, to the spirit of sacrifice, and to the American vision. [xi] Just as Thanksgiving Day, which incidentally was securely institutionalized as an annual national holiday only under the presidency of Lincoln, serves to integrate the family into the civil religion, so Memorial Day has acted to integrate the local community into the national cult. Together with the less overtly religious Fourth of July and the more minor celebrations of Veterans Day and the birthdays of Washington and Lincoln, these two holidays provide an annual ritual calendar for the civil religion. The public school system serves as a particularly important context for the cultic celebration of the civil rituals. Out of the first and second times of trial have come, as we have seen, the major symbols of the American civil religion. There seems little doubt that a successful negotiation of this third time of trial-the attainment of some kind of viable and coherent world order-would precipitate a major new set of symbolic forms. So far the flickering flame of the United Nations burns too low to be the focus of a cult, but the emergence of a genuine transnational sovereignty would certainly change this. It would necessitate the incorporation of vital international symbolism into our civil religion, or, perhaps a better way of putting it, it would result in American civil religion becoming simply one part of a new civil religion of the world. It is useless to speculate on the form such a civil religion might take, though it obviously would draw on religious traditions beyond the sphere of biblical religion alone. Fortunately, since the American civil religion is not the worship of the American nation but an understanding of the American experience in the light of ultimate and universal reality, the reorganization entailed by such a new situation need not disrupt the American civil religion's continuity. A world civil religion could be accepted as a fulfillment and not as a denial of American civil religion. Indeed, such an outcome has been the eschatological hope of American civil religion from the beginning. To deny such an outcome would be to deny the meaning of America itself (Bellah, ibid).
. . . The Declaration of Independence and the Constitution were the sacred scriptures and Washington the divinely appointed Moses who led his people out of the hands of tyranny. . . .
With the Civil War, a new theme of death, sacrifice, and rebirth enters the new civil religion. It is symbolized in the life and death of Lincoln. Nowhere is it stated more vividly than in the Gettysburg Address, itself part of the Lincolnian "New Testament" among the civil scriptures. Robert Lowell has recently pointed out the "insistent use of birth images" in this speech explicitly devoted to "these honored dead": "brought forth," "conceived," "created," "a new birth of freedom." . . . Behind the civil religion at every point lie biblical archetypes: Exodus, Chosen People, Promised Land, New Jerusalem, and Sacrificial Death and Rebirth. But it is also genuinely American and genuinely new. It has its own prophets and its own martyrs, its own sacred events and sacred places, its own solemn rituals and symbols. It is concerned that America be a society as perfectly in accord with the will of God as men can make it, and a light to all nations (ibid). How can one tell if he is a worshipper of ‘America’ ræther than the one true God? One place to start is by looking back at what received the most emphasis at one’s church and home these past couple of weeks: the Church’s holy days of our Lord’s Ascension and Pentecost, or the American holy day of Memorial Day? Let those who have ears to hear and eyes to see understand and flee from the religion and culture of America the New Babylon, and live instead as much as they are able by þe teachings, calendar, and all the rest of Christ’s Holy Orthodox Church. While major media speak of the recent spate of riots throughout the Islamic world as “spontaneous,” the financing of these “opposition” movements by major banks over the last decade says otherwise. But why? The rise of Islamic banking as a challenge to the Rothschild empire serves as a clear financial reason why the present governments in the Islamic world must go. The groups involved in financing the opposition in Egypt and elsewhere include, most commonly, the George Soros’ Open Society Institute, the International Crisis Group (ICG) of the Rothschild family and their many offshoots. Major figures sitting on ICG’s board include George Soros, Zbigniew Brzezinski, former Senator George Mitchell, Morton Abramowitz, Gen. Wesley Clark and Samuel Berger. They have donated millions of dollars to liberal groups operating against governments in strategic areas. The agenda is identical in each case: liberal democracy, secularism, feminism, and private banking. The mobilization of urban youth has long been an important aspect of Soros/ICG operations from Belarus to Bahrain. The creation of political opposition is only part of the story. These organizations, according to news sources such as the British Daily Telegraph and the Global Islamic Finance News, have been involved in training teachers, judges, police officers and bureaucrats in North Africa and elsewhere. The ICG and others are attempting to create a society that is no longer Islamic, no longer religions or traditional, but liberal, urban and open to foreign investment and banking. Given the interests of the players involved, the central concept is to ensure the presence of Rothschild banking in areas where it is being challenged both by the state and independent Islamic banking. The European Union is in a slow state of decomposition. Riots from Greece to Iceland have shown the bankruptcy of major European banks. On the other hand, Islamic banking operates with a total deposit base of over $1.5 trillion. In 2010, the British Daily Telegraph reported that the Islamic finance movement was challenging London for financial dominance through their investments in Bahrain, Egypt and Tunisia, using Tunis specifically as its new base. Back in 2008, the Washington Post wrote, “As big Western financial institutions have teetered one after the other in the crisis of recent weeks, another financial sector is gaining new confidence: Islamic banking.” The thrust of the article is that Islamic banks are more stable than Western banks, partially because of the refusal to charge interest or take excessive risks. This Post article sent warning signs to London, and the ICG stepped up its financing efforts in Islamic states in response. The Telegraph admitted that the new Islamic banks were doing some damage to London’s banking profits. At a time when the banking industry struggles with debt, a major challenger such as the Tunis movement could do some grave harm. The removal of non-liberal states means the ability for Western banks to more easily penetrate places like Libya, that has a government controlled central bank. Strong states in this strategic part of the world make it far more difficult for Rothschild banks to control finance in these states, and as a result, the “opposition” is created as a financial investment. It must then be an area they view of critical importance for control over peoples, theods, nations. What better reason therefore to begin local banking that is sundered from their control grid? We have heard much of the ‘petro-dollar’ of the American Empire and the stranglehold it has allowed the ‘Most Christian Country’ to keep on others around the world. Why not counter it with something like a ‘tilth-dollar’, as Robert Swann describes in ‘Appropriate Currency’ just below? If we are to expand and grow, and become more than a counter culture movement or a New Age subset of the larger culture, then we must create a new money system to replace the present system. Through this new system, the attributes we value-cooperation, self-reliance, community-can become growing and dominant within the entire culture. This is [the] direction our work needs to go, not only [to] survive the coming currency collapse, but also to develop what Schumacher called an "economy of permanence." Two important questions follow from that. The first is, what commodity has a universal measure of value in today's world? I would suggest that it's energy, and that we consider using some form of energy as the unit of measurement and as the reserve currency for redemption purposes. The so-called energy crisis has made it clear to almost everyone that energy is the key factor in all forms of production, and in meeting the needs of society as a whole. In this respect, commodities that provide essential energy are replacing gold as the traditional form of reserve currency. Thus oil is referred to as "black gold." The second question is, if we're looking to use a universal form of energy, where do we look? Obviously, the most sought after forms of fossil fuel energy, such as oil, are as poorly distributed and limited in supply about the earth as gold. What is needed is a form of energy that is both renewable and is universally available throughout the world. Therefore the surplus would be invested in forests, or directly in cords of wood. A community land trust would manage and control this resource. As a sufficient potential supply of cordwood from the forests became available, each depositor would then be issued a certificate (or note) measuring the value of his or her deposit in energy, or cordwood-meaning that the deposit would be redeemable in cordwood. With a ready and continuing supply of cordwood to "back" its currency, the group would then be in a position to "issue" or provide credit for projects of productive value within the local community. standard of living, now the sixth largest economy in the world, just above Canada and almost the same as Britain. about them and it will be believed. 50% of its 1995 price. Asia, Russian autos are in high demand. were below the poverty line by 25% under Yeltsin. Now, they are more than 50% above this line and are increasing. “Vladimir” tripled in popularity among newborn boys. that no one predicted—except Aleksandr Solzhenitsyn. Unfortunately, no one in the United States was listening. stated simply that Russian resources belong to Russia. Now, that commonsense statement was Putin’s death sentence. Unfortunately, carrying it out has been difficult. Russian national budget increased by 300-400% almost instantly. went against the system created by the Americans. was created by foreign advisers. received two pages, yet U.S.
on the last page. It’s true. I’ve seen them. expected. The war was and is no more. increase pensions and other social benefits. that put their interests first. It was not that hard to do. same gold reserves as the European Union. 36.5%, while inflation in 2010 was 8.8%. history, which was 74.3 years in 1990. 41% more than in 2000. If folks in the South and around the world want to live a life free of entanglements with the system of the God-, Orthodox Church-, and tradition-hating bankster-science-technology-industry corporate Elite, a good place to start is with food. It is certainly essential to turn away from the poisons of the McDonald’s, Monsanto’s, DuPont’s, etc. of the world. But it is also just as needful for us to learn again to grow our own food, using methods that are in harmony with the creation (Wendell Berry), so that we do not become thralls of such evil men again in æftertimes. It will require some effort, some rejection of comfort, but such things are more consistent with a Christian life of repentance than the easy, lazy life of American consumerism. One does not need the ‘40 acres and a mule’, however. Small plots of land can be very productive. 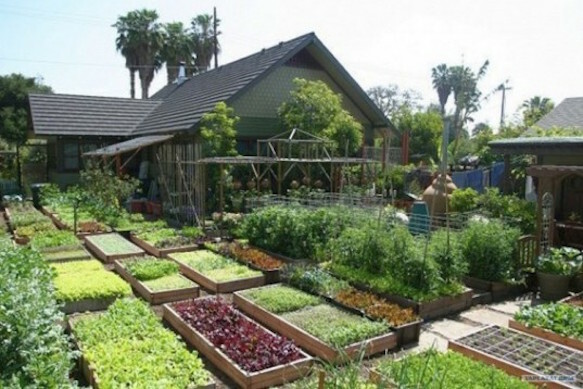 One family in southern California is producing 6,000 pounds of food each year on 1/10th of an acre of land. And not only is such food and farming better for the health of people and land and other living creatures, but it also opens the possibility for us to recover something else we have forgotten, a use for the creation that God intended that has all but disappeared from sight in industrial society. That use, as Fr Dumitru Staniloae tells us in Volume 2 of his Orthodox dogmatic theology series, The Experience of God, is to begin a tway-speech of love with our neighbors by giving the food we grow as gifts to them (or the crafts we make from trees, and so on). Furthermore, Fr Dumitru says, as we contemplate þe meaning of each thing God has made, the creation will also help us to have a dialogue of love with God the Most Holy Trinity, our Creator. All the material is there for us. It is time we began. I’m not a professional journalist or an expert in international affairs. Fortunately, one doesn’t need to be either to see what is going on in the popular western media these days. Living in America I am bombarded on a daily basis with the “expert” opinions on the Ukrainian crisis by a horde of analysts on the nightly news. The recurring theme in these interviews, regardless of political affiliation or news network, is the outrage felt by western leaders at the supposed “aggression” shown by Russia towards Ukraine. Conveniently, the aggression of President Poroshenko towards his fellow citizens in eastern Ukraine vis-a-vis the openly neo-Nazi Azov battalion and its ilk, goes almost entirely unreported. Be that as it may, one must ask, what precisely is it in the psyche of western leaders and pundits that makes them foam at the mouth with outrage at the crisis in Ukraine but turn a blind eye when it comes to similar incidents that are conducted by western countries or their allies? For example, on July 20th, 1974, NATO member Turkey under the leadership of then Prime Minister Bülent Ecevit launched the invasion of Cyprus known as “Operation Attila”. What reason did Mr. Ecevit give for this naked aggression and violation of international norms? The prevention of “Enosis”, which is Union with the Greek mainland, and the protection of the Turkish minority from alleged pogroms by Greeks whose population, at the time, made up approximately 77% of the Island. The result of the invasion was the bifurcation of Cyprus into the internationally recognized Republic of Cyprus and the so-called TRNC or Turkish Republic of Northern Cyprus who is only recognized by Turkey. On paper, the TRNC is considered by Turkey to be a separate state but in reality, the TRNC is a de facto part of Turkey. In other words, an annexation. Now one would expect, all things being equal, that similar outrage was shown towards Turkey for its illegal invasion and subsequent occupation of northern Cyprus. Unfortunately, we live in a world where things are not equal. The Western response? Negligible at best. There was no American castigation of Turkey or heavy sanctions. No military build-up of American forces on the Turkish border or heaping of opprobrium by the western media. And interestingly, there were no Hitler-Ecevit comparisons made on a daily basis like there have ubiquitously been throughout the western press since the reunification of Crimea with Russia. No, on the contrary, Turkey cemented its ties with America and Europe and continues to receive billions of dollars worth of military aid through the Truman doctrine. Unlike the violent invasion of Cyprus by Turkey, which claimed the lives of thousands, Crimea was received into Russia by a free and fair referendum in which an overwhelming majority of Crimean residents chose unification with Russia. The American response to the Turkish invasion was silence. Yet, when it comes to the people of Crimea exercising their democratic rights and their right to self-determination, which America holds as universal right, the response is outrage, sanctions and threats. But the larger theme here is the western opposition to Orthodox countries who hold traditional Christian values. In many ways the Orthodox world is a thorn in the flesh. It frustrates the west because the Orthodox world, in large measure, never experienced anything like the so-called “Enlightenment” which started the process of secularization and de-Christianization of the west in the 18th century. The idea of a strong and robust nation that holds to traditional Christian values is an idea that Western Europe finds repugnant in the extreme. Why? Because such a nation would be an ideological rival and that is something that the current order can’t tolerate. Western nations have been globalizing their secular values by branding them as “human rights” and using human rights organizations as a cudgel to browbeat, into submission, those nations who hold to traditional values. But of course, this only applies to those traditional countries that do not tow the line of the western agenda. If you are a country like Turkey, a country that has manifold human rights abuses, you get a free pass because you have acquiesced to the program of western hegemony. This is why America and Western Europe are mostly silent on the issue of human rights violations by countries like Saudi Arabia and Turkey. But for Orthodox countries like Russia and Serbia, no such pass is given and chastisement abounds. As a friend of mine said, enlightenment liberalism is the true religion of the west and those who refuse to convert can expect no quarter.